Really now Mother Earth, this is crazy. I feel so sorry for those people stuck in extreme flooding not even that far away from us. This is the kind of weather you need to escape under a blanket and have something comforting to eat. I’ve actually been feeling very exhausted today, but I made a very quick batch of cupcakes for my mum to take out tonight to see her friends. 1) Put oven on to 150 degrees (fan assisted). Place around 8 cupcake cases into a muffin tray. 2) Heat the butter and honey together in the microwave for 30-40 seconds, or in a pan, until the honey is fully melted and the butter is just softened. 3) Mix the sugar and butter/honey mixture together until smooth. 4) Add the eggs, and combine. 5) Sift in the flour, mix together. 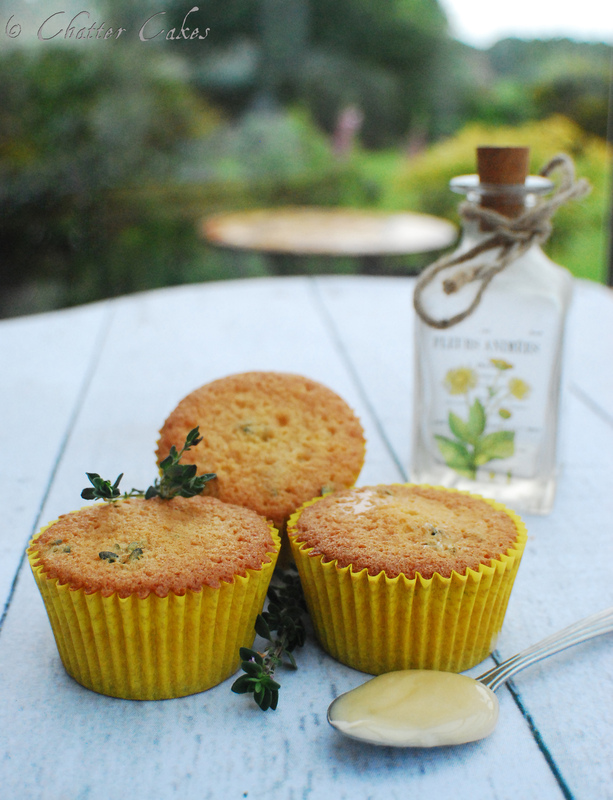 6) Add the lemon essence (you can always add extra if you want to, I did mine to taste), and the lemon thyme leaves. 7) Equally distribute the mixture between the cupcake cases. 8) Bake for around 20-22 minutes, until a cake tester comes out clean. Leave to cool on a tray. Oh… Bad mother left them on the chair in the living room. And now the others can see what they missed! Sigh… But at least I got one! 🙂 yum. Really good recipe.